There is limited evidence of Damiana’s stimulant effects. It has not been shown to treat cancer in humans. Damiana is a wild shrub found in Mexico, Central America and parts of South America. It is used as a diuretic, laxative, stimulant, aphrodisiac, and also to treat diabetes and venereal diseases. Animal data show that damiana can reduce anxiety and affect sexual behavior but there are no human data. Damiana has not been studied in cancer patients. Damiana may affect blood sugar level based on animal studies. Traditional use is widespread. A small study in women with sexual dysfunction showed that ArginMax, which contains damiana, improved sexual function. Data from studies done on mice show that damiana reduced anxiety but human studies are lacking. There are no data to substantiate this use. Traditional use is widespread but there are no data to validate this use. Damiana is a wild shrub prevalent in South America. It is used in traditional medicine as a diuretic, laxative, stimulant, aphrodisiac and for treating diabetes and venereal diseases. In vitro and animal studies have shown that damiana acts as an anxiolytic (1), stimulates sexual behavior (3) (13) (14), and has hypoglycemic (7) (9) , anti-ulcer (15) and cytotoxic (16) effects. It is used in the botanical formulation ArginMax (4), which is marketed for the treatment of sexual dysfunction in women. Data from studies of damiana’s estrogenic activity are conflicting (8) (12). Oral intake of capsules containing a mixture of damiana, Yerba Mate, and Guarana led to weight loss in healthy volunteers (5). Diabetics should use damiana with caution as it may potentiate the effects of hypoglycemic drugs. Damiana has not been studied in cancer patients. 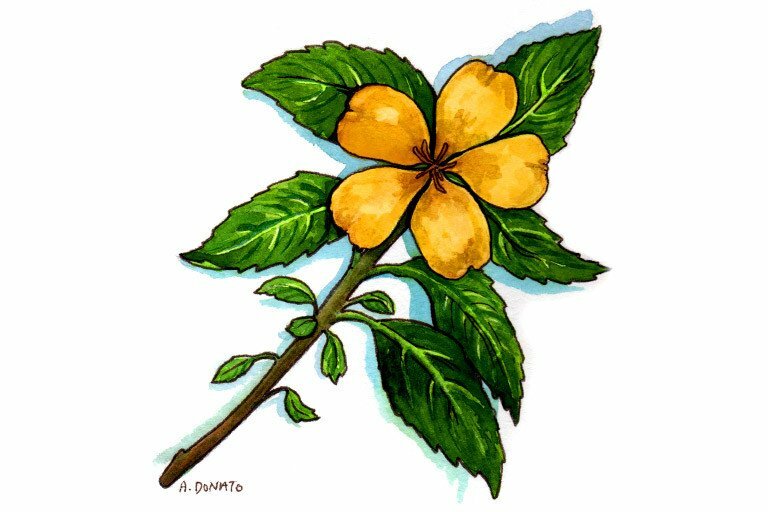 Damiana’s anti-ulcer activity is believed to be due to the inhibition of lipid peroxidation, immuno modulation and antioxidant effects of its major constituent, arbutin (15). In other studies, a damiana extract and pinocembrin and acacetin, compounds derived from the herb, suppressed aromatase activity. Other compounds including apigenin 7-glucoside, Z-echinacin and pinocembrin demonstrated estrogenic activity (12).The pro-sexual activity of damiana was shown to involve the nitric oxide pathway, with the anxiolytic property of the herb thought to contribute to such effects (14). Kumar S and Sharma A. Anti-anxiety Activity Studies on Homoeopathic Formulations of Turnera aphrodisiaca Ward. Evid Based Complement Alternat Med 2005; 2(1): 117-119. Alarcon-Aguilar FJ, et al. Investigation on the hypoglycaemic effects of extracts of four Mexican medicinal plants in normal and alloxan-diabetic mice. Phytother Res 2002;16(4): 383-6. Arletti R, et al. Stimulating property of Turnera diffusa and Pfaffia paniculata extracts on the sexual-behavior of male rats. Psychopharmacology (Berl) 1999;143(1): 15-9. Polan ML, et al. Estrogen bioassay of ginseng extract and ArginMax, a nutritional supplement for the enhancement of female sexual function. J Womens Health (Larchmt) 2004; 13(4): 427-30. Andersen T and Fogh J. Weight loss and delayed gastric emptying following a South American herbal preparation in overweight patients. J Hum Nutr Diet 2001;14(3): 243-50. Perez RM, et al. A study of the hypoglycemic effect of some Mexican plants. J Ethnopharmacol 1984; 12(3): 253-62. Zava DT, Dollbaum CM, and Blein M. Estrogen and Progestin bioactivity of foods, herbs, and spices. P.S.E.B.M. 1998; 217: 369-378. Alarcon-Aguilara FJ, et al. Study of the anti-hyperglycemic effect of plants used as antidiabetics. J Ethnopharmacol. 1998; 61(2):101-10. Zhao J, Dasmahapatra AK, Khan SI, Khan IA. Anti-aromatase activity of the constituents from damiana (Turnera diffusa). J Ethnopharmacol. 2008;120(3):387-93. Estrada-Reyes R, Ortiz-López P, Gutiérrez-Ortíz J, Martínez-Mota L. Turnera diffusa Wild (Turneraceae) recovers sexual behavior in sexually exhausted males. J Ethnopharmacol. 2009 Jun 25;123(3):423-9. Estrada-Reyes R, Carro-Juárez M, Martínez-Mota L. Pro-sexual effects of Turnera diffusa Wild (Turneraceae) in male rats involves the nitric oxide pathway. J Ethnopharmacol. 2013 Mar 7;146(1):164-72. Taha MM, Salga MS, Ali HM, Abdulla MA, Abdelwahab SI, Hadi AH. Gastroprotective activities of Turnera diffusa Willd. ex Schult. revisited: Role of arbutin.J Ethnopharmacol. 2012 May 7;141(1):273-81. Avelino-Flores Mdel C, Cruz-López Mdel C, Jiménez-Montejo FE, Reyes-Leyva J. Cytotoxic activity of the methanolic extract of Turnera diffusa Willd on breast cancer cells.J Med Food. 2015 Mar;18(3):299-305.